Emperor Hanzei (反正天皇, Hanzei-tennō), also known as Emperor Hanshō, was the 18th emperor of Japan, according to the traditional order of succession. No firm dates can be assigned to this emperor's life or reign, but he is conventionally considered to have reigned from 406 CE to 410 CE. Hanzei is regarded by historians as a "legendary emperor" of the 5th century. The reign of Emperor Kinmei (c. 509 – 571 AD), the 29th emperor, is the first for which contemporary historiography is able to assign verifiable dates; however, the conventionally accepted names and dates of the early emperors were not to be confirmed as "traditional" until the reign of Emperor Kanmu (737–806), the 50th sovereign of the Yamato dynasty. Hanzei was the son of Emperor Nintoku and Iwanohime. He was the brother of Emperor Richū; and this succession effectively by-passed Richū's two sons. No other details have survived. 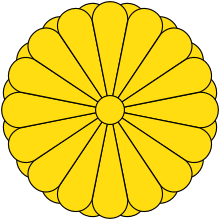 Hanzei's contemporary title would not have been tennō, as most historians believe this title was not introduced until the reigns of Emperor Tenmu and Empress Jitō. Rather, it was presumably Sumeramikoto or Amenoshita Shiroshimesu Ōkimi (治天下大王), meaning "the great king who rules all under heaven". Alternatively, Hanzei might have been referred to as (ヤマト大王/大君) or the "Great King of Yamato". The Nihongi records that the country enjoyed peace during this emperor's reign. The description of Hanzei in the Kojiki is daunting as he is described as standing over nine feet tall and have enormous teeth all the same size. He is said to have ruled from the palace of Shibagaki at Tajihi in Kawachi (present-day Matsubara, Osaka); and he is said to have died peacefully in his palace. The actual site of Hanzei's grave is not known. This emperor is traditionally venerated at a memorial Shinto shrine (misasagi) in Sakai, Osaka. 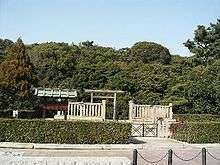 The Imperial Household Agency designates the Tadeiyama kofun (田出井山古墳) in Sakai as Hanzei's official mausoleum. It is formally named Mozu no mimihara no kita no misasagi (百舌鳥耳原北陵). 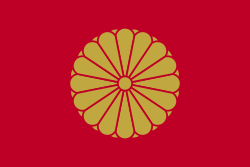 1 2 Imperial Household Agency (Kunaichō): 反正天皇 (18); retrieved 2013-8-28. 1 2 Ponsonby-Fane, Richard. (1959). The Imperial House of Japan, p. 38. ↑ Titsingh, Isaac. (1834). Annales des empereurs du japon, p. 25;Brown, Delmer M. (1979). Gukanshō, p. 257; Varley, H. Paul. (1980). Jinnō Shōtōki, p. 112. 1 2 Aston, William. (1998). Nihongi, Vol. 1, pp. 310–311.